Firearms and ammunition are available for rent at location. Firearms and ammunition are additional. Includes range officer to ensure your safety throughout your shooting experience. Large selection of firearms to choose from including handguns, shotguns and Ar 15’s. 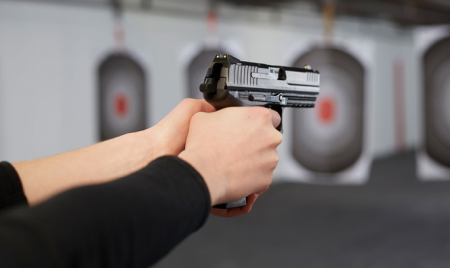 At a Glance The folks at Straight Shooters Indoor Range have taken great care to provide a safe, clean, and advanced shooting range experience. Each aspect of their range, whether it is their heavy-duty ventilation systems or special lighting to illuminate the entire range, is designed with safety in mind. In addition to heavily-stocked retail store, the staff have access to over 1,000 different parts and accessories and can offer next-day delivery to their store, at no additional cost. Promotional value expires 120 days after purchase. Amount paid never expires. Valid only for unlicensed shooters. Limit 1 per person, may buy 2 additional as gift(s). May be repurchased every 90 days. Must be 18 or older. Merchant is solely responsible to purchasers for the care and quality of the advertised goods and services.